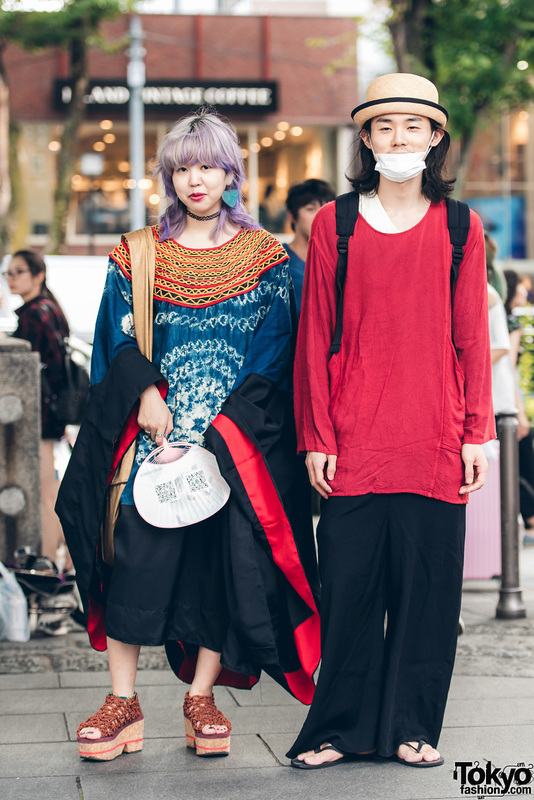 Harajuku duo in vintage street fashion w/ dolman sleeve kaftan dress, platform wedges and sling bag, long sleeve shirt over t-shirt, black pants, hand-me-down slippers, black backpack and a hat. Harajuku girl with a cute hairstyle wearing a sheer coat over a kanji-print top, a checkered miniskirt, and chunky platform heels. Pink-haired Harajuku girl with a cute-meets-edgy style featuring a rose-pattern sweater, ripped stockings, and studded rocking horse shoes.